Financial contributions (gold coins, and the like) to continue this blog is always welcome. Just kidding, not kidding. Blogging takes time, effort and honesty. The balance and grace required to write cohesively about matters that are poignant and deeply important to me is a blessing. Albeit, as of right now, I produce it all - the graphics, the blog, the links, partnerships, and programs. It is a labor of love, and yes, I do love it. And still, your loving support is greatly appreciated. Your generous support goes much further than just monetary gifts. It is the intent and energy of how we come together as a community that fosters goodwill and continued blossoming. 1. Subscribe - Join Our Mailing List. It's Free. There's no charge. We don't SPAM. We will never sell your email address. Unsubscribe anytime. You will be saying "Yes, please" to a dose of positivity to enliven your day, and to motivate you to be your best. 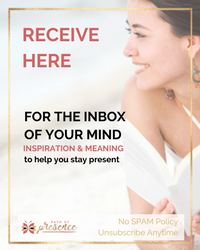 We deliver right to your inbox, weekly, or semi-monthly new posts that will inspire you to live awake and be present to your sacred life journey. We do not intend to send regular mailings more than once a week. Subscribe Here. Consider what is offered and take it into practice in your daily life. Practicing and integrating Presence: Moment to Moment Mindful Awareness of your experience, each and every day. Allow yourself to be fully present, immersed in the unfolding of life. Know that you are one with The One - in the flow of the universe. Do your own work. Compare yourself ONLY to your personal best. Sit in The Silence. Affirm your goodness. Listen to what is yours to do. For inspiration and practical spiritual instruction, read / subscribe to our articles on The Practice Blog. Read the blogs that spark interest, or catch your eye. Talk to us and be part of the conversation. Read & comment on our blogs (Comment below!). Send us an email with your thoughts if you are not called to make a "public" statement or conversation. Every time you buy something, you are voting for it with their dollars. Our business model follows a blog format. Most bloggers get paid in exchange for their review of products or items. In the blogging world, these are called affiliate relationships. Some bloggers have product partners that they link to and get paid a small referral stipend. Amazon links are offered as recommended products. We may do some or all of this to support this blog. Purchasing through one of our links is at no additional cost to you. Clicking through to our links only tells our sponsors that you (as the reader) is interested in what they have to offer. If you are not inclined to purchase, by all means, please do not. Clicking through to our links does not cost you anything, but, it helps us (bloggers) understand what is of interest to you. Your click through to a link will tell content creators, product manufacturers, and marketing outlets (like Amazon) that you showed up on their page - that you have been made aware of their products from one of our links. If you buy something from them, they reward us with a small stipend. Like tips to restaurant wait staff, these small referral stipends help support our blog. Yes, every bit helps. 5. Take a Class, or Buy a Product. Over the course of this year, we will be building content to support your practice to presence: from informational tidbits to practical "how to" courses, to printable downloads and more. Taking a class, referring it, or sharing it will greatly help and support our cause. Don't worry - we won't be peddling kitchen sinks or inappropriate programs. We will only offer programs we feel you may be interested in, to further your practice of presence, empowerment, inspiration, meditation, personal growth, and the like. Be a catalyst for increased awareness and awakening. If you like an article, if it made you think, share it with others on one or more (or all) of your social media platforms. Social Share buttons are at the top and the bottom of every post we produce. If you are a writer in the motivational / inspirational / self-development genre, let us support you. LET'S SUPPORT EACH OTHER! Contribute a guest post and allow us to work with you to be your online marketing partner. If writing is not your thing, but you would like to have a discussion instead, consider being a guest on our podcast. Contact Us and let's talk! Need I say more? Good grief we are in the year of 2018, beautiful folks!! Just like how we went from black and white to color, landlines to cell phones, and records (to CDs to streaming) to podcasting, IT'S TIME. Please join us!! Thank you, and thank you again for making all the way to the bottom of this post. If you are called, please leave a short message below to say “hi!” 👋🏼. Dear Friends, I would love to hear from you below! If you are a fellow blogger: please comment on one (or as many as you are called). Have I missed 1 (or more) ways people can support their favorite blogger? What is your favorite collaboration? What is the best thing about being a blogger? How do you wish you were more supported? What do you want those who visit your site to know? If you are inclined to share your blog, please be sure to leave your URL as part of your signature so those who visit this site can click through to yours. What do you think about the points above? ANY OTHER THOUGHTS? WE'D LOVE TO HEAR FROM YOU!